Drawing in the University Today – International Meeting on Drawing, Image and Research & FBAUP Museum of the University of Porto, are proud to host a public drawing, performance, video and sound composition followed by a keynote lecture by the Polish-American artist Monika Weiss. 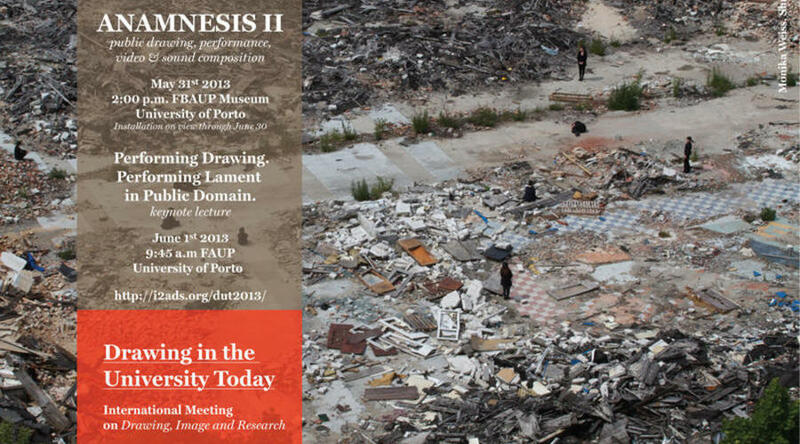 The performance will take place at 2 p.m. on May 31st, at the FBAUP Museum of the University of Porto. The audience is invited to participate in the performance. The installation Anamnesis II will remain on view until June 30th. 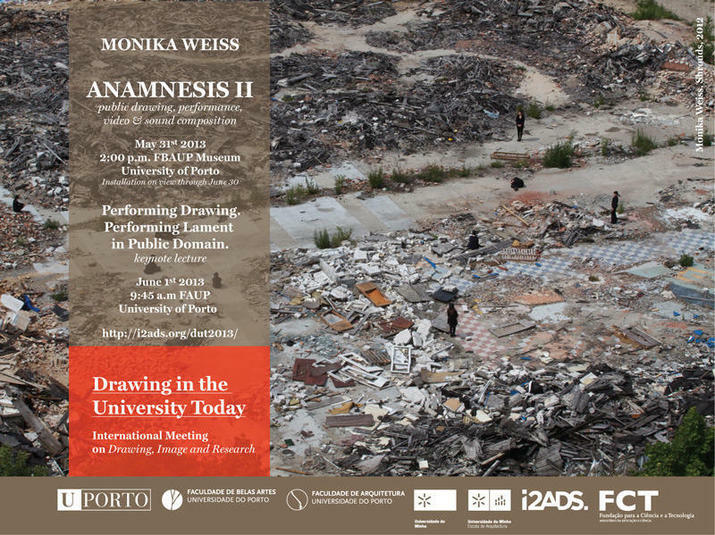 The artist’s keynote lecture “Performing Drawing – Performing Lament in Public Domain” will be held on June 1st at the Faculty of Architecture at 9.45 a.m.
Monika Weiss' Anamnesis II is a site-specific, ephemeral installation that includes public performance, projected video and sound composition. As a systematic inquiry into the relationships between history, public space and the space around the body, the work addresses the performative act of drawing as related to speech, trace, erasure and disappearance. It is part of a series of performative installations like Drawing Lethe (2006) and Shrouds (2012), which evoke ancient rituals of lamentation as traditionally performed in response to war. Her current work considers aspects of public memory and amnesia as reflected within the physical and political space of the City. Originally educated as a classical musician, the artist continues to compose sound environments for her installations and cinematic works. Weiss is renowned for the use of her own body as a vehicle of artistic expression and for incorporating historical documents and narratives within her works. “Performing Drawing—Performing Lament in Public Domain” is an keynote lecture by Monika Weiss on the nature of drawing as a performative language sited within the space of historical memory and contemporary urban landscape. Monika Weiss proposes that both ancient forms of expression—drawing and lamentation—share complex relationships with the notions of trace, history and postmemory. In this work Weiss suggests how collective mourning, including for the loss of purported enemies can also become a powerful political tool in opposition to the heroic masculine narratives of conquest and power. By enacting ancient gestures of lamentation, Weiss’ work also considers contemporary contexts of apathy, indifference, invisibility, and historical amnesia within the public forum and polis. Drawing in the University Today is proud to present, as keynote speakers, the Polish-American artist Monika Weiss (Washington University in St. Louis), the architects Eduardo Souto Moura (Universidade do Porto) and Pedro Bandeira (Universidade do Minho), Professor Frederic Fol Leymarie (Goldsmiths College), and Alastair Adams and Simon Downs (Drawing Research Network, Loughborough University). The FBAUP Museum of University of Porto is characterized as university museum, both as a place of specialized research around the theory and artistic practice, and as a place and diffusion of knowledge and communication with the world outside the university community. The Museum FBAUP has particular characteristics that distinguish its holding from the collections typically found in other university art museums, as it integrates international drawings and prints, as well as those by old European masters, with special regard for works of art by Portuguese authors.